The enterprise version supports seamless integration with the CRA electronic services that include T1 Efile, CRA ReFile, efiling of the T1013 and T1135 forms, CRA Auto-fill my return service, CRA Express Notice assessment and CRA PAD feature. 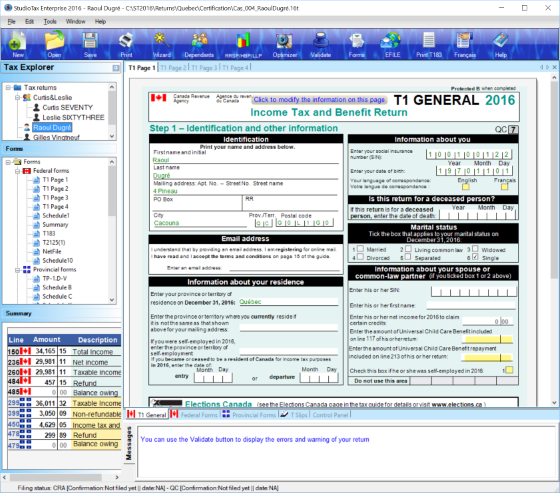 The enterprise version supports both official languages and TP1 Quebec provincial returns. You can active the same license on 2 different computers such as an office computer and a laptop or home computer. · Accuracy: Since 2005, StudioTax is certified by stringent CRA requirements. Starting by tax year 2010, StudioTax enterprise is certified by Revenue Quebec for Quebec provincial returns. · Proven record: Every year 100s of thousands of returns are prepared and filed using StudioTax. StudioTax is becoming the tax preparation tool for a large number of new users every year. · Intuitive user interface: Almost no learning curve is required to get up and running with StudioTax. · Productivity: Form based for direct data entry with a quick start wizard that captures CRA required data to minimize error corrections at filing time. Above and beyond the superior StudioTax technical features, we are committed to making StudioTax Enterprise available at a modest cost with no limit on the number of returns you can prepare and file.